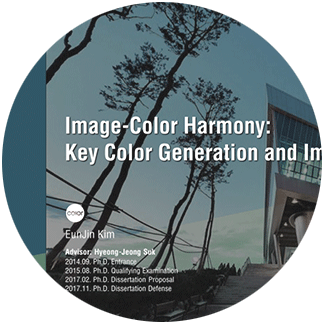 Eunjin presented her doctoral dissertation entitled as, “Image-Color Harmony: Key Color Generation and Image Recoloring.” She attempted an interdisciplinary approach to synergize the technique of computational imaging and theory of color harmony toward a proposal of practical solutions. For example, when a corporate color is given, her algorithm retouches some colors within an image, so that the image fits best to the corporate color. Reversely, when an image is provided, her solution proposes sets of palette that designers easily create matches between an image and a solid color. In design practice, particularly in layout design, such process has relied on designers’ manual efforts. In this regard, Eunjin demonstrated that designers could reduce time and efforts to make the first drafts and thus may more focus on more elaborative creation. At the same time, any novice users can easily try out a good layout by facilitating her solution.